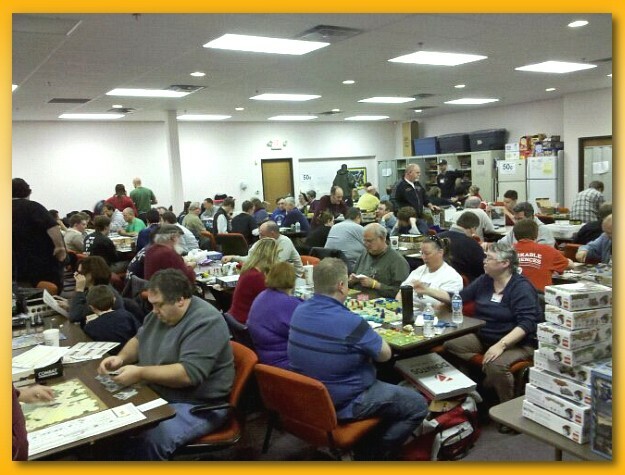 The Columbus Area Boardgaming Society (CABS), besides meeting several times each month, sponsors a special After Turkey Day board gaming event. Lisa and I had attended the CABS 2009 After Turkey Day event and were looking forward to it again this year. 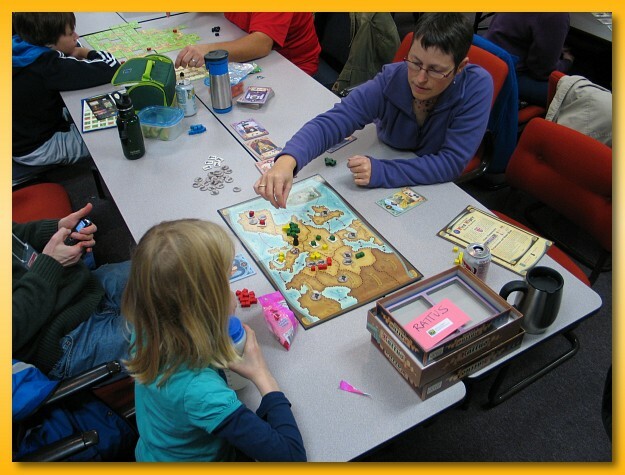 We arrived around 11:30 and spent roughly 12 hours playing games in a packed house. At the peak, there were probably 125 people crammed in the event room playing games shoulder to shoulder at the tables. While walking to the car, Lisa said she couldn’t believe we spent 12 hours playing games. She went on to say that when you play games like that with friends it just goes so fast! Pretty much sums it for me too. This year was a special 48 straight hours of games running from 6am Friday morning to 6am Sunday morning but unfortunately we could only attend for those 12 hours. Maybe next year! We played two games of Aquädukt. This was my first time at this nice little, family-style, tile laying game. Players are trying to lay down tiles and make sure they “get watered” from the canals built from one of the five wells that get placed in the game. The game goes very fast and can be over before you know it and, surprisingly, has a relatively high degree of cut-throat take that built into the mechanics. Nice filler. I finally was able to crack the shrink on my Rattus: The Pied Piper Expansion and we took in a game playing with a few of the expansion cards. We chose to randomize the new cards with the old cards choosing one at random from each “class”. Those potion tiles sure come in handy! I, unfortunately, forgot to take a picture but I did get to introduce a couple of new players to Dice Town. This game has become my go-to game for family fun. It’s easy to learn, easy to teach, and most people really enjoy the rattling of the dice and the excitement of revealing your rolls. It has just the right mix of take that with the stealing of cards, bribing the sheriff, and the offensive General Store cards. Fun stuff in a fast-paced game. We played three or four rounds of No Thanks!, a great little card game from way back in 2004. I’d recently picked up a copy as a filler for light game gatherings and this game really fits the bill. Another great game where you can play as many or as few games as you like depending on the time you have to fill. An amazing feat for a few cards and some plastic chips. I taught The Speicherstadt to four other players and we had a ball working through the meeple bidding and the cube shipping. Money is so tight in the game and I got creamed by the lack of fireman when the fires hit. Great game! Next up was Lost Cities: The Board Game. Lisa and I had, in the past, played the heck out of our copy of Lost Cities the card game but I was happy to be taught the board game version. I was very pleasantly surprised. The added treasure hunting, “steps”, and point tokens that you find along the various paths add a bit more strategic depth to what had become a relatively mechanical card game. It seems harder to get stuck in this game but there are still those moments when you’ve got to make some big decisions about how many numbers to skip when moving your explorer along the path. I wouldn’t mind owning a copy for a nice family game. Next up was Bacchus’ Banquet a weird card drafting game of deduction. Each player represents a secretly held identity and is driving to collect cards in kind appropriate to their hidden role. 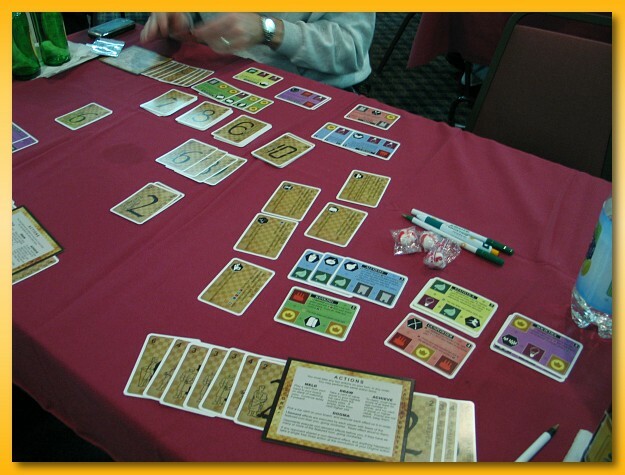 A player with initiative grabs three cards from the ring of cards on the table, keeps one, discards one, and gives the third to one of the players. This “gift” can be rejected (without looking at it) by passing it to another player. This continues until someone accepts the card or it makes its way back to the originating player who must accept it. Each player has 10 points of “waistline” in which to meet their goal of eating food and drinking wine and most cards cause an increase in the level before hitting 10 and becoming incapacitated. Many cards cause your level indicator to be reduced or grow and the numerous “bad” cards and other “special” cards keep it interesting. I didn’t like the game very much though. If nobody passes you a card you’re pretty much sitting there doing nothing. The only way to get initiative is to accept a gift so there was a fair amount of down time (for me any way). Our group had a lot of issues with the ambiguous text on many of the specialty cards and one-time use hidden special card everybody gets at the beginning of the game. I’m always up for learning a new game and I’m glad I got to play it though. To close the night, Lisa and I got in another game of The Speicherstadt, this time with three. I’ve played twice with five and once with three and I suspect that four is the sweet spot. The game is very different with three than with five, three feeling a bit prescribed and five a bit chaotic. However, it’s definitely fun without that feeling of it breaking down at the edges like many games. Well, another Turkey Day down and a lot of games and fun packed into a surprisingly short day. What’s funny, is we gamed with pretty much the same group the entire time and there’s no reason we couldn’t have that same gaming day experience several times a year. All it takes would be some organization and taking time from our ridiculously busy lives. We should take some time off to smell the roses, or cardboard as the case may be. 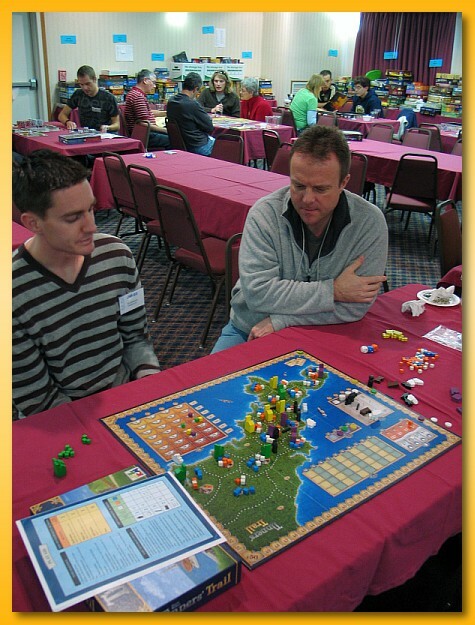 I was lucky enough at the 2010 Great Lakes Games to pick up a copy of Inca Empire from the prize table. There were three copies available but I started to get a bit worried that they’d all be gone by the time my name was called but I was very excited to be able to grab the last copy when my name was mercifully drawn. 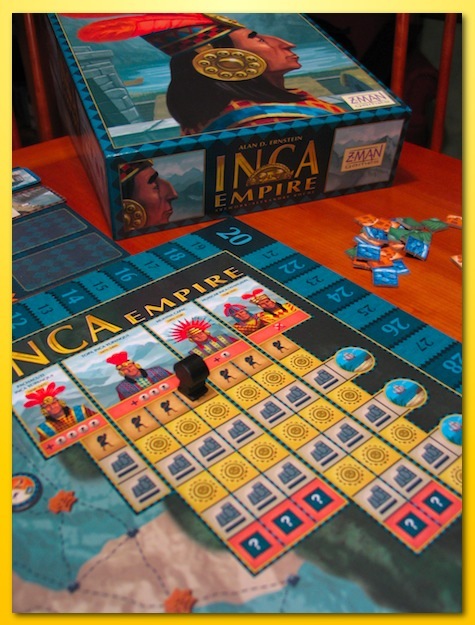 Inca Empire is a game for 3-4 players that lasts about 90 minutes depending on which variants you choose to play with. The game comes with some built in modifications for shorter games if that’s more to your liking. The game is considered a reimplementation of the game Tahuantinsuya but but since I’ve not played it I cannot comment on the differences. 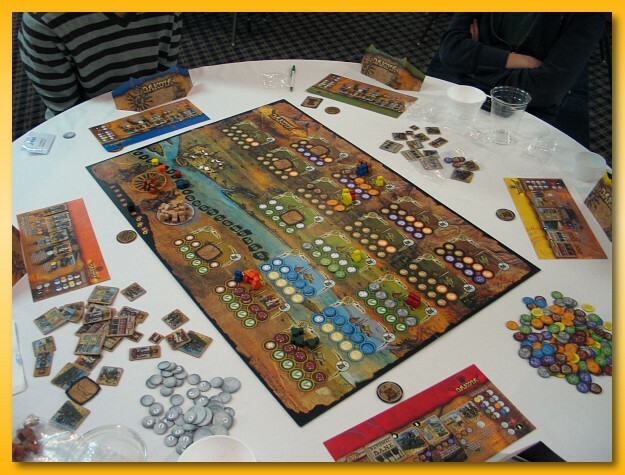 The artwork of Inca is superb and it’s what originally caught my eye when scanning through the recent geeklists on Essen games. The bits are well made and very brightly colored. The roads “sticks” are very small but the tight board makes that a requirement. The box comes chock full of thick cardboard chits in various shapes and sizes representing, cities, terraces, garrisons, culture markers, and labor (people). There are numerous chunky wooden yellow temples, and more road sticks than you can, well, shake a stick at (240 in all). Top that off with a very nicely done board, a small satellite board, a small deck of cards, and a few more bits of various kinds and you’ve got a very full box. My only gripe is with the iconography of the cards. After your first game, you’ll know them well, but you’ll need the rules close by to understand what each “sun” card means for that first game or two. 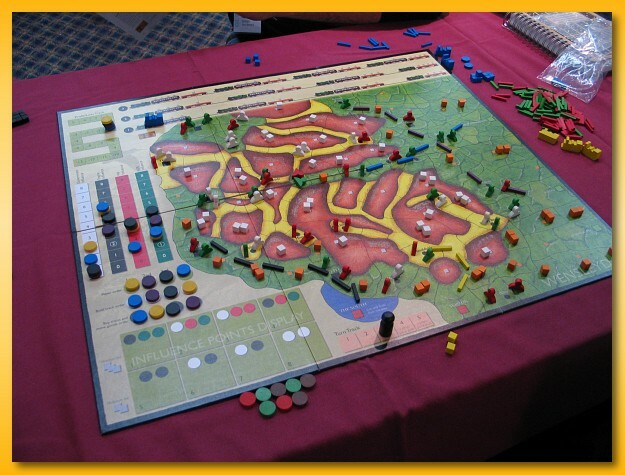 At a high level, Inca Empire is a route/network building game. Players represent Incan leaders “Apu” that wish to expand their influence on the regions that surround the ancient city of Cuzco. 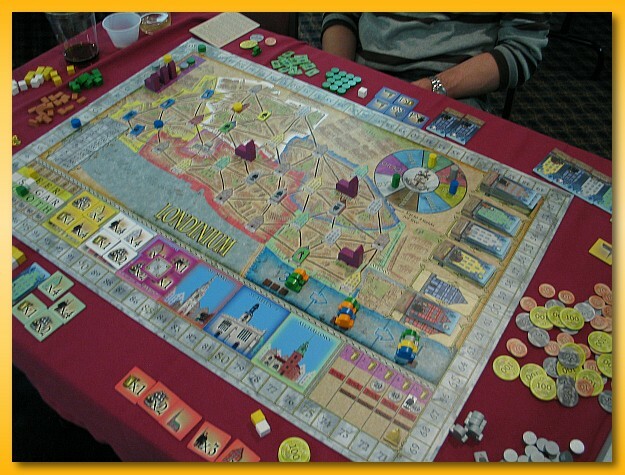 Players earn points for conquering territories, building garrisons, cities, temples, and terraces. There is no direct conflict between Apus (you’re all trying to make the Incan Empire stronger) but the more structures your network connects to (whether you were the original builder or not) will determine which player will shine the most brightly in the eyes of the divine ruler, the Sapa Inca. The individual steps of the game are tracked using the the Era Track shown above. This track is divided, vertically, into 4 eras indicated by the large images of Incan rules depicting different eras of the Inca civilization. Each era is subdivided vertically into one or more rounds represented by a column within a given era. Each column is further subdivided into phases, where each phase is depicted by icons representing the following phases: Inca, Sun, People, and Sapa Inca. A large wooden Inca figure stars in the upper left and moves top to bottom, left to right, through the era track until reaching the final bottom phase of the last era. 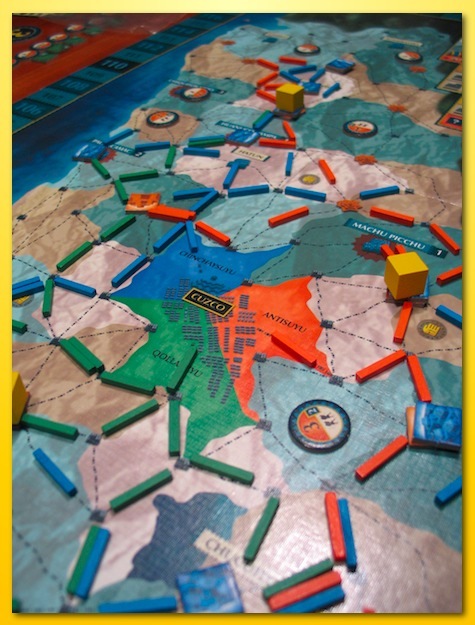 Player colors and their corresponding starting positions (dictated by the map) are randomly assigned and a road (a stick of the appropriate color) is placed extending from a fixed starting position in Cuzco. Each round follows a pattern with the first phase (the top item), representing the number of labor tokens you receive at the beginning of the round. I equate the labor tokens to the money of the game. You get money, and then you get to spend it during the round as the marker moves down through the various phases of the round. When it hits the bottom (the Sapa Inca phase) you score the value of your network that you’ve built. 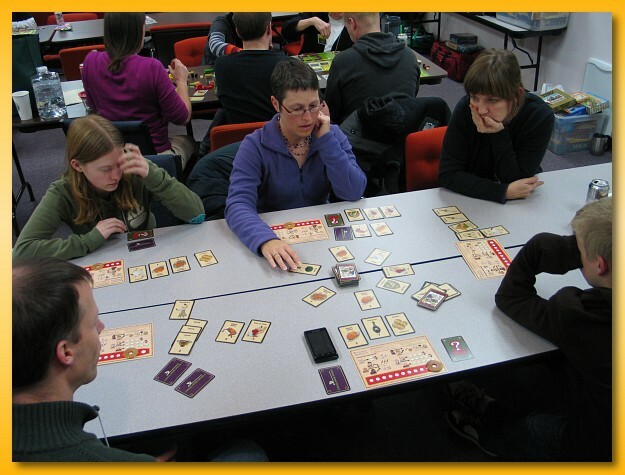 In between getting your labor tokens and scoring, are alternating phases of playing cards and then building. Some rounds have more or less card/build phase pairs but the pattern is always the same (excepting the first round which no cards exist). Players are dealt a hand of three “sun” cards at the beginning of the game and during the card phase, players get to choose a card from their hand and place it on the satellite board. The player in last place gets to place her card first followed by the next player, etc. This small satellite board (the Sun Event board) is divided into quadrants separated by the colors for each player. Laying a card in a quadrant exposes the two players whose colors are adjacent to the card to whatever effects the card depicts. The sun cards depict positive and negative impacts and last throughout the entire round. Some cards may make it easier to conquer new territory, other cards may cause roads to be destroyed, or to make it more difficult to build a city, etc. Multiple cards played to the Sun Event board have a cumulative effect so as they build up players must choose wisely between positive cards and negative cards and to whom they should apply. Every card played affects two players so there are some tough decision to make. 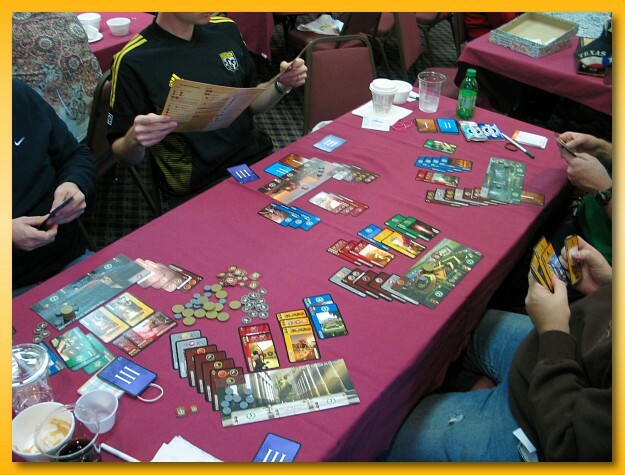 After the card playing phase, players enter the build phase of the game. This is the real meat of the game where players got to perform two things in either order: placing up to two roads followed by “building” something. 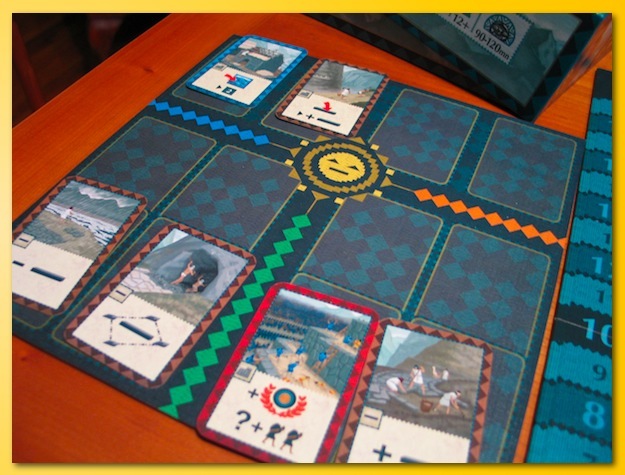 Placing two roads allows the user to put two sticks on the roads that lead from his starting position at Cuzco. Branching is allowed but you must always remain connected back in a continuously linked road back to your starting area at Cuzco. The map is broken into small territories riddled with roads and settlements. Each territory contains a culture token of unknown value (face down) that becomes exposed (turned face up) whenever a neighboring territory is conquered or a road becomes linked to the border of the territory. The culture token represents a resistance value, a number of points, and an indicator of the number of labor tokens you will receive in addition to your normal allotment at the beginning of the round. Road placement rules dictate that you can only build a road segment into an unconquered territory if one end is connected to the border of a conquered territory so you’ll need to conquer some territories to keep building your network. The build phase of your turn allows you to perform one of several actions: conquer a territory, build a garrison, build a city, build a temple, build a terrace, or build an additional road. All of these actions require you to turn in various numbers of labor tokens (spend your money) and your ability to earn more labor tokens each round is based on the value of the culture tokens of the regions you conquer. Conquer more territories and you’ll get more labor tokens to spend. However, the more time you spend conquering, the less time you’ll have to build the other items allowed in this phase. In most cases, conquering a territory also earns you victory points as does building the other items. However, you must keep in mind that there are multiple building phases each round and the sun cards can greatly affect what you’re capable of accomplishing on your turn. You may retain just enough labor tokens to build a city on the subsequent build phase only to find that someone has played a card that requires an extra one or two labor tokens to build a city thwarting your hopes and dreams. At the end of the round, you score the value of your network earning points for each item your network connects to. You’ll earn these points repeatedly each round so building up quickly and getting connected to the structures built by your opponents is key. At the end of the scoring round, the cards are wiped from the Sun Event board and the next round begins. There’s an opportunity for turn order to change at the beginning of every Sun Card phase as well as a catchup mechanism at the beginning of each round requiring the leader to pass earn labor tokens to the player in last place (giving them more “money” to use during the turn). The number of “free” labor tokens decreases each era which also indicates how many can be carried over from one round to the next. 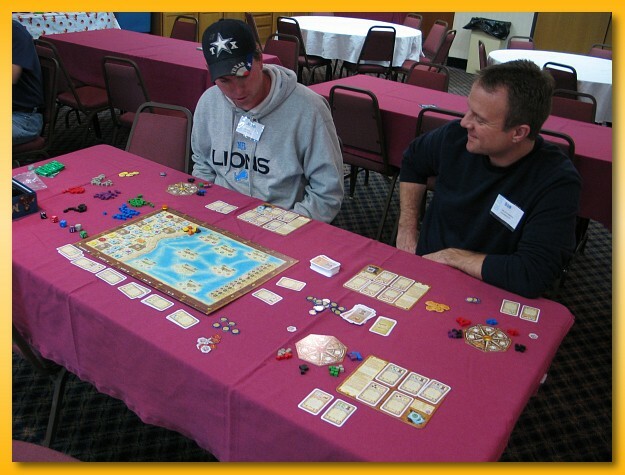 By the final round, players receive zero free labor tokens and must endure a grueling round of four building phases using only the labor tokens earned from conquering regions earlier in the game. The final Sapa Inca phase scores the final structure of each players network and the player with the most points wins. 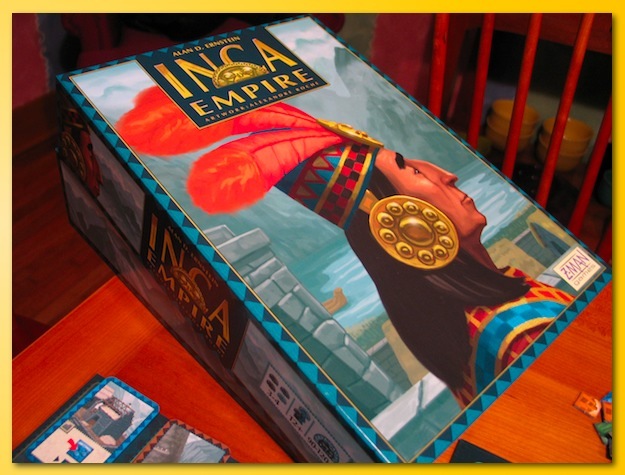 I’ve enjoyed my two playings of Inca Empire and look forward to more. The game comes with a set of four “invasion” markers, three depict ships and one depicts Pizzaro. These tokens are placed randomly face down, next to the final four build phases and after each phase, the token is turned face up. If the token depicts, Pizzaro, you jump immediately to the end game scoring skipping subsequent phases in this round. The gamer in me feels that that’s a bit lame having a variable and surprise ending but it does fit the theme well and can cut short an otherwise relatively mechanized final round. I enjoy the nifty cooperation aspects of the game where players vie to build roads to stay near other players so that they can easily connect to the structures they build (earning points during the scoring phase) while trying to build farther away to keep others from connecting to their structures. A player left to their own devices will most likely wither and come in a distance last. You’ve just got to connect to other players to earn points quickly and blocking is next to impossible (there are cards that let other players build roads where roads don’t exist on the board or to share existing roads with other players). The game is relatively chaotic and the randomness of the cards does reduce the pure strategy but it doesn’t seem to take the fun out of the experience for me. I highly recommend the game and look forward to my next play. Great Lakes Games 2010 is a wrap and I’ve got the post board game convention blues. But I’m already thinking about next year. Dave Vander Ark has, again, done an awesome job with setting up and running the invitation-only, three-day gaming extravaganza. Thanks Dave and kudos for a job well done! I arrived on Thursday afternoon and although it was still relatively early there were numerous tables with games already in progress and the tables around the walls were starting to fill up with games. I unpacked the games I brought helping to form the communal library, checked in my games for the prize table, and within minutes I was sitting down to a game of Macao for three. The first time I played Macao it flowed slowly and I was a bit worried about the downtime. However, this time it flowed nicely without the dreaded analysis paralysis kicking in those last few rounds. Macao is a bit of mish mash of mechanics but they all seem to work pretty well. Although there are ships to sale around and an attempt to layer on a theme, the game is pretty much about allocating dice to get cubes to “buy” cards that let you you chain together actions to earn points. We picked up a 4th player and launched immediately into a game of Last Train to Wensleydale. I’d always heard it was a pretty good game so we went into the rule book cold. Like wading into ice water it was a bit rough but we persevered and came out on the other side better gamers for the ordeal. Like most Wallace games, the setup is a function of placing cubes into regions using some structured randomizing technique. Played on one of the most grotesque boards imaginable, the game actually plays pretty well. Although the word train appears in the title, it’s not really a train game in my opinion. The lightly themed game is really about penetrating the interior of the board to build routes to pick up resources while behind you the big train companies are gobbling up the track. If you like variable turn order, this Wallace title has it in spades feature three (!) turn order tracks for you to monitor. All in all a worthwhile endeavor to play but getting through the rules was a bit tough. After a break for dinner we launched into a game of Egizia, one of my favorites. This was my 3rd or 4th playing and it’s still a fun time. The basic worker placement mechanic coupled with the nifty placement restrictions and the card collection mechanics make for an all around enjoyable game. Not wanting to stay up too late, we played a quick game of Wyatt Earp. I’d recently picked up a copy in a BGG auction and was itching to play. Wyatt sits firmly in the filler category but at the heavier end. 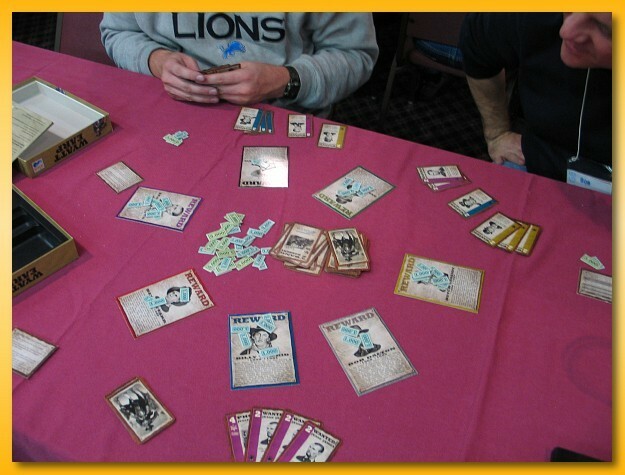 This light set collection game features card drafting in an attempt to play sets in strong enough numbers to both capture the outlaws and too capture the lions share of the reward. It’s light and almost plays itself but would make a great closer on game nights. 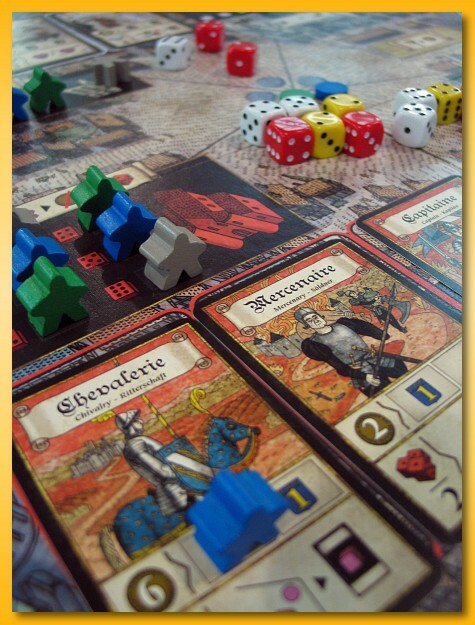 On Friday morning, my gaming buddy Bob and I sat down to read through the rules to Troyes. Talk about confusing. Even after having someone walk us through the rough mechanics we still felt the need to start at Page 1 and step through word by word…pretty rough sailing. Troyes is not for two, or I suspect three for that matter. 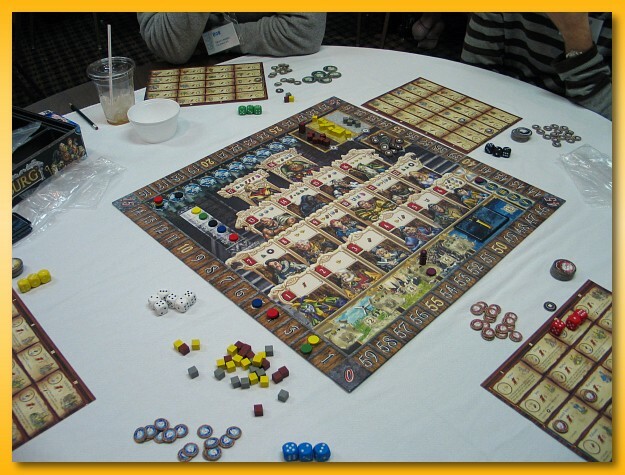 The game features rolling dice and allocating them to different areas of the board that allow for scoring points. There are some relatively mind bending rules about gathering dice from other players, forming sets, placing “worker” meeples and cubes on cards, fighting off the bad things happening in each round, etc. Troyes felt like a mish mash of too many mechanics in my opinion leaving me unsatisfied given the effort put into forging through the rules. The artwork, however, is top notch. Kudos on that front. Feeling the need to get in another Wallace game and since Jared had arrived, we sat down to a game of Tinners’ Trail. My copy is the original Wallace version but I must say I like some aspects of the art for the second edition. I like Tinners’. It’s a simple game of cube collection and investment. It’s got the standard Wallace turn structure including a nifty “time” component to taking some more powerful actions that mix up the turn order. At times, players can sit out for a turn or two while others catch up. Timing when to pass can be crucial to start early in the next round or to hang back in hopes of picking up a new mine cheaply. I consider Tinners’ one of my favorite games. Jared is a Hamburgum lover so we pulled out the big board and played on the Londinium side. The game has no random aspects and all information is known. With the added rondel, the game is relatively heady experience. In this particular game, players were singularly focused on individual regions slamming down 3 and 4 donations at a time which was a rather stark deviation from my previous games. A bit on the longish side for my tastes but still good enough for me to not want to trade away my copy. 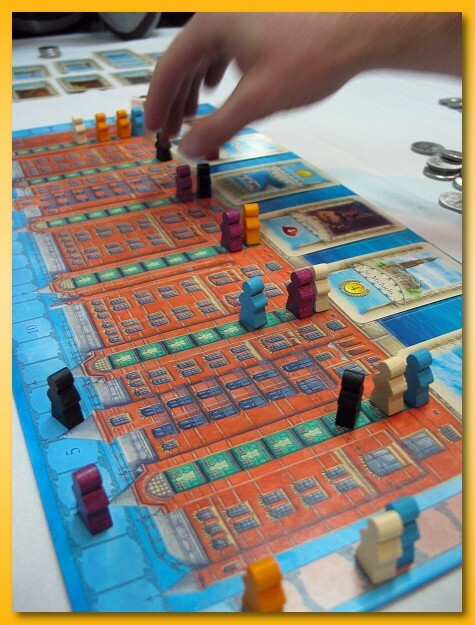 Speicherstadt is a devious game of out meta-gaming your fellow players as you vie for cards that come up each round. 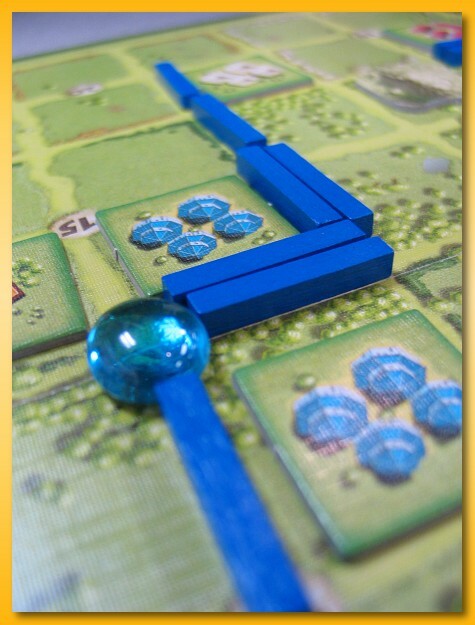 Players place meeples along tracks and players must pay the amount indicated by the sum of the placed meeples for that card or pass. The next meeple gets a change to buy the card for one less coin. This very simple mechanic coupled with a very tight money system makes for some touch decisions. Any game that can be taught to five people and played in less than hour is a winner in my book. I’m looking forward to a new copy in the mail very soon. As silly as it sounds, I’ve never played Kingsburg but we sat down with five and played with the expansion “coins” that make the “monster fight” at the end of each round more strategic. I had a great time and really wish I had the coin to buy both the base game and the expansion. Maybe my secret Santa will come though for me this year! 🙂 The game features a nice dice rolling and allocation mechanic but with some aggravating player interaction. Placed dice grant you resources and other items whereby you can then build buildings. Players choose different paths to victory depending on which buildings the build but you’ve got to watch out not to ignore the monster that comes out every round in an attempt to knock down your hard earned efforts. Cool game with the expansion chips. In a moment of insanity, we decided to close the night by starting a game of Dakota at 11:30 with five players and nobody knew the rules. As the last ones out of the gaming room, we locked up at 3:15 am and crawled back to our rooms for some much needed sleep. I didn’t find that much of interest in Dakota. I was hoping for more but it may be that my brain was starting to shut down. I did enjoy the division of players into the two camps (native americans and settlers) and the ebb and flow of cooperation and back biting that occurred. The game can get a bit nasty with players explicitly placing bits to take advantage of other players weaknesses so you’ve got to be ready to get picked on. if you’re not into that, then Dakota definitely is not for you. We started Saturday morning with Toscana a light, and relatively uninspiring game of wine production. Featuring some interesting artwork reminiscent of the the “Mad Men Yourself” website, players vie for producing crates of wine that will be the most valuable by game end. 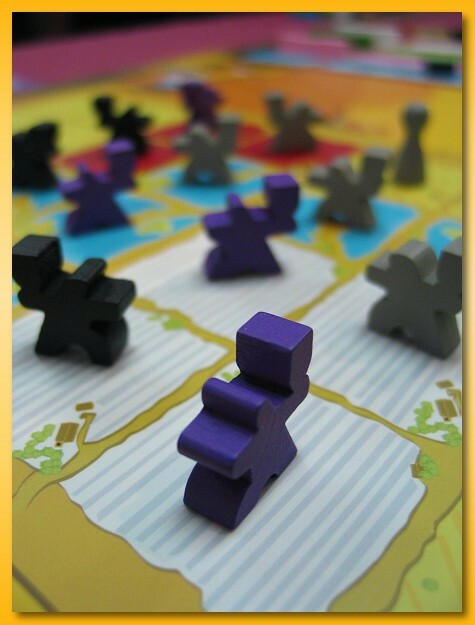 Players place the cool wino-meeples on a grid of vineyards that produce a kind of wine when watered. There is a bit of an market manipulation aspect of the game but in general its a relatively mechanical process. I can understand why the game comes with other vineyard “maps” given the static nature of the base game. 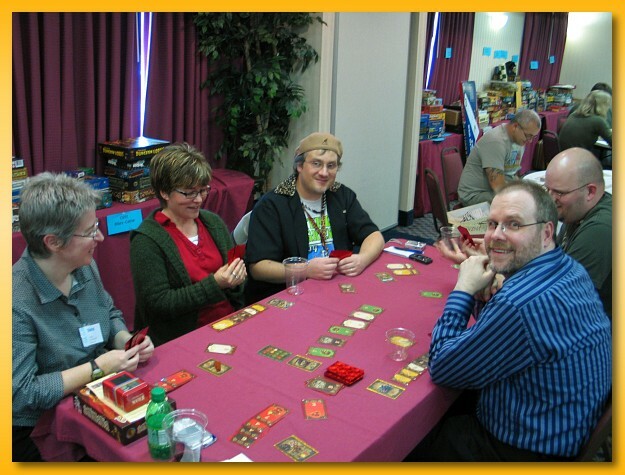 The highlight of GLG was, in my opinion, 7 Wonders. I couldn’t help but jump on the preorder bandwagon as soon as I got home. We had five new players and we read through the rules and played in under an hour. Awesome! With hardly any down time, players get dealt a hand of cards and after picking one, they pass the whole hand to another player (left or right depending on the round). Everybody simultaneously exposes the card they chose and lays it down. Some cards represent resources that you’re allowed to produce, others represent items that you collect for victory points, some represent military strength, others provide special abilities. Many cards require prerequisites of goods or other buildings but if you have the cash you can buy the necessary items, if available, from your right and left neighbors. Very neat and fast paced game. I’m really looking forward to my next play. Next up was Maus au Chocolat and nifty little set collection game with some special powers thrown in. I’d really like to be able to find a copy but I might have to order it from France. But, although the game was cool, I got to play it with some very special BGG members: Diane Close (pdclose), Jess Ayers (Jatoha), Dave Van Sweden (vandemonium), Jamie Wilson (cold_fuzion), and Paul Close (too_close). I had a great time meeting them and getting the chance to play a game. Next up was a learning game of Magnum Sal. 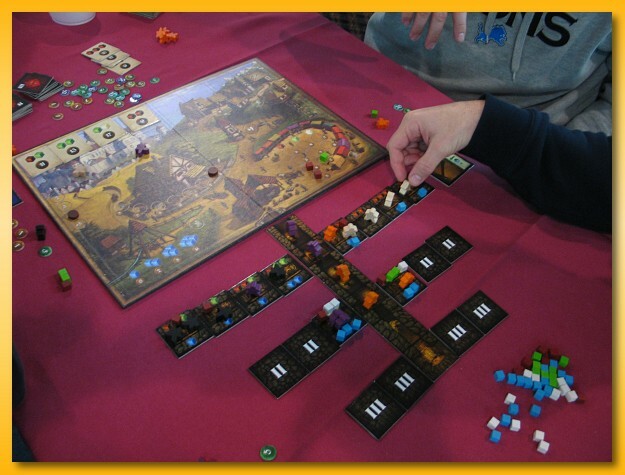 The game features a relatively simple worker placement mechanic amid a Caylus-light salt mining theme. 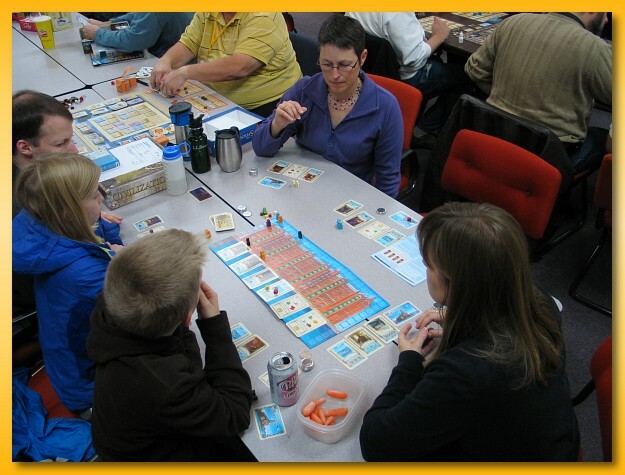 Players buy and place meeples into the mine and vie to fend off the water to mine the different types of salt used to fulfill the royal salt orders. Fulfilled orders earn victory points. Our first game had some rough spots figuring out how to use the path to the royal orders and how to make the best use of the “tools” cards but all in all, I can see the game in there. I’m not ready to buy a copy but I’d be interested in playing again. The artwork is very nice. After quick games of Haggis and Drive we participated in the great GLG prize table giveaway where I scored copies of Inca Empire and Dragonheart. My brain started to go but my wife and I teamed up to play the third player in a game of Innovation. Innovation is a chaotic romp of card collection and screwage. It’s not a game for me and it’s a lot longer than I expected. I’d be happy to never play it again. The game is loved by many, and that’s fine, but it’s just not my cup of tea. I tried to persevere through the rules to Isla Dorada but my brain just could not process the information and we aborted the attempt. Since most of us were mentally wiped and midnight was behind us, we wrapped up the final night with 5 rounds of The Bottle Imp and a full game of Wyatt Earp. 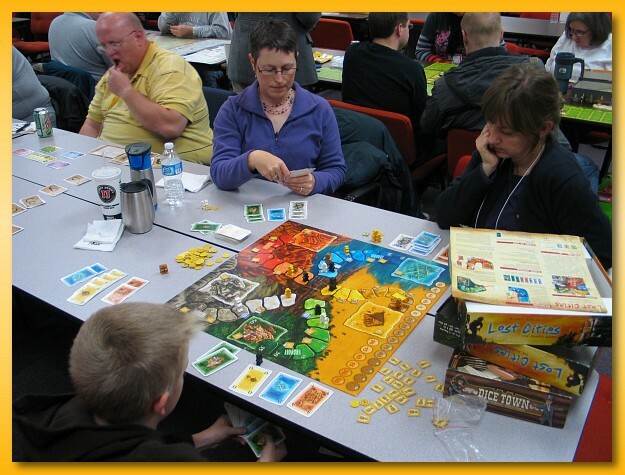 I greatly enjoy my time at GLG and always look forward to sampling the new Essen games and putting in several days dedicated to gaming. Here’s to next year! I apologize for the typos, bad grammar, and worse than normal writing skills (is that even possible for me?!) as I’m still mentally fried from the experience. Bring on the games!. Tomorrow morning I’m off to the yearly Great Lakes Games convention held in Indiana. I’m looking forward to three solid days of gaming with friends, hot Essen releases, and general hanging out with like-minded people. As an added bonus, on Sunday I’ll be attending my niece’s wedding! 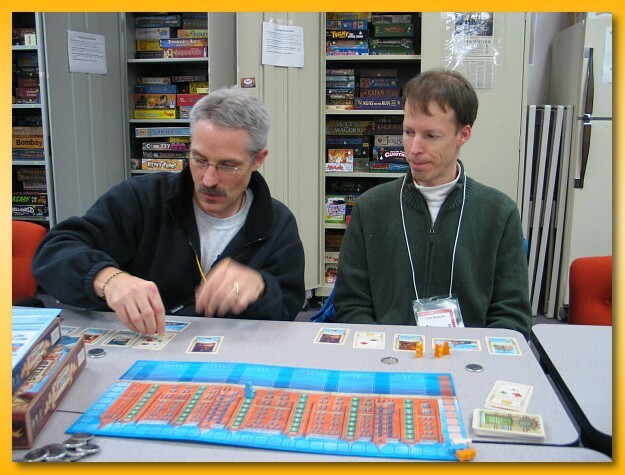 Here is a link to my the 2009 Great Lakes Games Report.